But aren't profits necessary? Isn't that what drives invention and efficiency? This solution element challenges the very core of modern civilization. Today's industrialized societies, whether democratic or not, are based on the implicit goal of short term maximization of corporate profit. That's why we see the stock market index on the front page of so many newspapers and websites. That's why industrialized societies see maximum economic growth as vital to a nation's well being and any disruption of that growth as the worst thing that can happen short of war. If the human system's goal is short term maximization of profits, then all sorts of side effects are guaranteed, like the environmental sustainability problem, the recurring wars problem, the recurring large recessions problem, excessive economic inequality, and institutional poverty. These problems occur because not solving them increases profits. All this would change if we can resolve the root cause of the life form proper coupling subproblem. Two social life forms are improperly coupled. The analysis found that the root cause of this subproblem is mutually exclusive goals between the top two life forms in the human system. Corporatis profits has the goal of short term maximization of profits. Homo sapiens has the goal of the long term optimization of quality of life, for these living and their descendents. These goals are so mutually exclusive they cannot both be achieved at the same time. One life form will win and one will lose. Presently Corporatis profits is winning and Homo sapiens is losing. Proof of this may be found in the many unsolved problems whose solution would benefit the common good of The People. Lack of an international body that runs the world according to the wishes of Corporatis profitis. Solved by creation of the World Trade Organization. It has far more power than the United Nations. Lack of a world wide political ideology that supports the goal of Corporatis profitis over Homo sapiens. Solved by control of the conservative party in the US, Canada, Australia, England, and other nations, as well as the media and portions of the educational system and bodies of science, like economics. Lack of laws giving corporations the powers they need to be supremely dominant over people. Solved by centuries of corporate judicial activism. 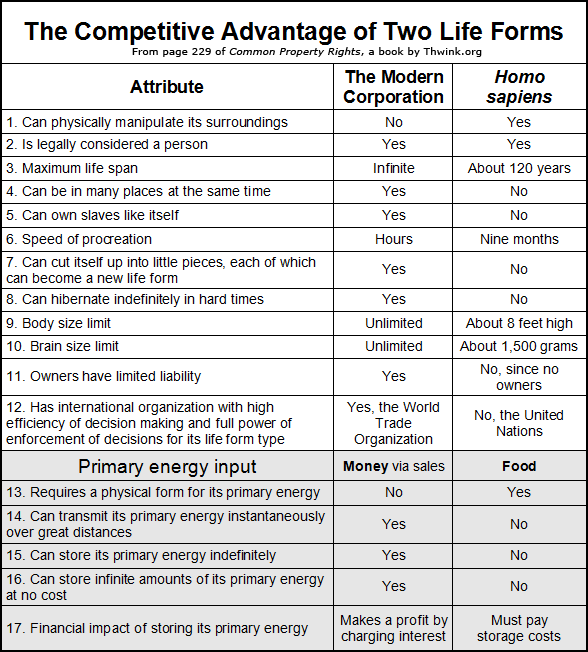 The result is summarized in The Competitive Advantage of Two Life Forms. Study the table. It's like the poker player with a winning hand. With the right bluff (deception) and careful study of the other players, he manipulates the betting so a big pot accumulates. Then the call comes. He lays down his hand and says "Read 'em and weep." How can Homo sapiens turn the tables and gain the winning hand? By finding the correct high leverage point to resolve the root cause. The root cause is mutually exclusive goals between large for-profit corporations and people. How can we best resolve the root cause? This is straightforward. If corporate and people goals are incompatible, then one or both goals must be changed until they are in agreement. Since democracy is of the people, by the people, and for the people, it makes little sense to compromise and change the goal of people. Therefore the solution is to change the goal of the corporate life form to one that aligns with that of people. As long as the top goal of corporations remains unchanged, the system will behave about the same because the goal of the dominant agent in a social system determines the general behavior of the system. Therefore the high leverage point is correctness of goals for artificial life forms. Since the one causing the problem right now is Corporatis profitis, this means we have to reengineer the modern corporation to have the right goal. That's our central solution strategy: reengineer the modern corporation to have the right goal, one that supports the goal of Homo sapiens. On the right is the famous Anthora coffee cup, designed in the 1960s by Leslie Buck for the Sherri Cup Company. With its classic Grecian motif and charming motto of "We are happy to serve you," the cup instantly became as vivid an emblem of New York City as the Statue of Liberty. Sales of the cup ran into the hundreds of millions annually, nearly all in the New York area. 2.0 corporations will have a fundamentally different attitude. Instead of being only too happy to serve themselves, they will now embody the words on the cup because 2.0 corporations are humble servants created by the people, for the people, to serve the people. Moving to Corporation 2.0 is radical change. The definition of radical is: "1. of or going to the root or origin; fundamental: a radical difference." 1 Radical change is required to resolve root causes. There is no other way. The purpose of this solution element is to design Corporation 2.0 such that its goal is in full alignment with the goal of Homo sapiens and it can continue its role as producer of the goods and services needed by humanity. This element pushes on the high leverage point of correctness of goals for artificial life forms. Once those goals are correct, the system will automatically zoom towards proper coupling at such high speed it would seem shocking—if we hadn’t already anticipated it with our simulation graphs. Corporation 1.0 is the New Dominant Life Form, Corporatis profitis. Corporation 2.0 will be the New Super Servant, Corporatis publicus. Its goal is to serve its creator and master, Homo sapiens¸ as best it can. Its role is to do that by providing needed goods and services. This is the role of a trusted servant. It must be trustworthy because it has so much potential power. determines the goal of the system. If that goal conflicts with those of policy makers then the system will exhibit high systemic change resistance. No amount of pushing and poking to force the system to fully accept a new solution will work. But once the goal of the system’s dominant agents agrees with a preferred solution policy, the system will “want” to adopt the new policy and then solve the problem as fast as possible. The system will snap from the old to the new mode as a rapid phase change occurs. This works because goals create balancing loops. Such loops balance the formidable power of reinforcing loops by regulating them to behave as desired. If a system has the right balancing loops on the system’s key reinforcing loops, then the rest of the system can do anything it wants because the system as a whole will pursue the right implicit system goal. If the root cause is the wrong goal, then the solution is the right goal. The goal of Corporation 2.0 would be providing the goods and services needed to optimize quality of life for people in a socially, environmentally, and economically sustainable way. There is no need for pursuit of profits in that goal. In fact, the newly engineered Corporation 2.0 should have no incentive to maximize profits, since that causes the corporate dominance loop to appear. 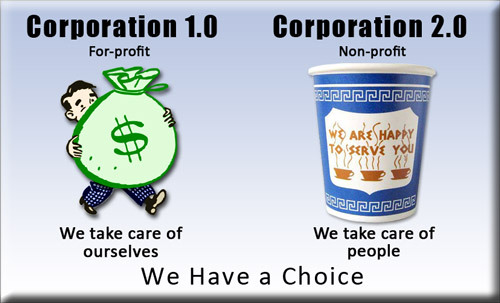 Therefore Corporation 2.0 should be non-profit. This is a radical change. But once you understand the analysis it's fully justified. Retained earnings would be allowed. These internal profits are necessary to build the assets necessary to carry out the corporate life form's new goal, which can be summarized as "optimize quality of life for people." Dividends to owners or stockholders would no longer be allowed. Gone is the perverse incentive to maximize short term dividends at the expense of all sorts of terrible side effects. Corporate law is hereby amended to redefine allowable types of non-federal corporations. The type widely known as for-profit is no longer permitted. This leaves the other type, non-profit, as the only allowable type. This act shall take effect on the last day of this year. The five defining characteristics of the modern for-profit corporation have until now been: (1) separate legal personality, (2) delegated management, (3) limited liability, (4) transferable shares, and (5) investor ownership. Hereafter the last three characteristics are prohibited except in the case of non-profit worker cooperatives. For-profit corporate stock may no longer be bought or sold. Nor may dividends be paid on it. The intent of this law is to align the goal of the modern corporation with that of Homo sapiens, whose goal is to optimize the common good for all living people and their descendents. This corporation is an artificial life form created by humans to serve their needs and is thus not a natural person. Nor is it an artificial person. It is an artificial servant. The overriding goal of this servant shall be to serve the needs of its human master to the best of its abilities, by providing goods and/or services that benefit the common good first and its customers second. No other goal shall have a greater or equal priority. To allow a smooth ten year transition that does not disrupt the welfare of the people, a percentage of corporations, chosen at random, shall be converted each year. This shall start at .125% in the first year and increase to .25%, .5%, 1%, 2%, 4%, 8%, 16%, 32%, and finally 36.25% in the tenth year. For-profit corporations are encouraged to convert earlier than the year they are selected, since this will enhance their reputation as a trustworthy servant and thus increase their likelihood of survival. At the end of each year, for that year’s converting corporations all their stock shall change to the equivalent of loans by shareholders to corporations. Loan value per share shall be calculated as the tangible book value of a corporation divided by the total number of shares. The full principle of these loans shall be paid off to loan owners over a period of thirty years. During that time interest on the remaining principle shall be paid quarterly at a rate of, for each stock, the average dividend rate for the last five years for common shares and the stipulated dividend rate for preferred shares divided by average share value. This is of course only a rough illustrative example in plain English. The hodgepodge of different incorporation laws in the states of some countries should be replaced by uniform national laws. This eliminates the tendency for a race to the bottom among states to break out, as states compete for more revenue via weaker incorporation laws. For the same reason, uniform international law should eventually be implemented. Isn't that what drives invention and efficiency? A powerful hypnotic fallacy promoted by the corporate life form is that profits are necessary to motivate invention and entrepreneurs towards efficiency. What they really mean is profits in their present form of dividends to outside owners. There are other approaches, namely a non-profit approach. The Corporation’s companies manufacture consumer goods, capital goods, industrial components, products and systems for construction, and services to business. [including] refrigerators, washing machines, ovens, dishwashers, and boilers... chip removing and sheet metal forming machine tools... automation and control products for machine tools, packaging machinery, machinery for automating assembly processes and processing wood, forklift trucks, electric transformers, integrated equipment for the catering industry, cold stores, and refrigeration equipment.... [for the auto industry] brakes, axles, suspension, transmission, engines, aluminium wheel rims, fluid conduction, and other internal and external vehicle components. ... business consultancy services, architecture and engineering, property consulting, design and innovation, systems engineering for electromechanical installations, and integrated logistics engineering. The Mondragon Corporation, thousands of credit unions and agricultural coops, hundreds of thousands of NGOs, and more are an example of what a solution to the corporate dominance problem would look like. Each is living proof this solution can work... because it already has worked. All we need to do is scale up this already proven solution. Thus Corporation 2.0 is not as radical a change as it may seem at first glance. It's a solution that's already been tested. There it sits on the shelf, just waiting for its time to come. (1) A special thanks to Justin Gravlee for the definition of radical and why it's so appropriate to the analysis. (2) Quote on design of corporation from The Divine Right of Capital: Dethroning the Corporate Aristocracy, by Marjorie Kelly, 2001, p129. (3) The Mondragon Corporation material is from the Wikipedia entry on the topic.